Children crave a safe spot where they can gather to daydream, to share secrets, to savor summer’s sweet, long day s. In her richly textured new novel One Day and One Amazing Morning on Orange Street, Joanne Rocklin takes readers to an empty lot in California, where a large Valencia orange tree provides the perfect meeting place for four friends who live on the same street. Ali, Robert, Bunny, and Leandra love the tree, with its strong climbing branches, its cool shade, and its juicy oranges — the best in the world. They’ve been hanging out there for as long as they can remember. What they don’t realize is that their beloved orange tree is under threat. “It was a hot summer day on Orange Street, one of those days that seem ordinary until you look back on it,” begins the novel. This was the day the orange traffic cone arrived at the curb. It’s also the day a stranger arrived, with a mystery harking back decades and touching the whole community. Rocklin captures the goofy imagination of ten year olds, with their fanciful clubs and their farfetched conjectures. She draws a lifelike portrait of each of the four, who share a deep need for friendship. Told from alternating perspectives of the children and their elderly neighbor Ms. Snoops, the novel reveals each character’s hopes and fears. Ali, for instance, has a little brother who has recently had brain tumor surgery. Bunny, whose mother travels frequently, tries to keep her anxiety and obsessiveness to herself. Leandra feels grumpy at the prospect of a new sibling, and Robert aspires to be a magician. Ms. Snoops (whose actual name is Ethel Finneymaker) is over 80 and remembers Orange Street when it was part of a grove of trees. When her memories fade — as they are doing — who will be left to share the neighborhood’s history? In just a day and a half, these engaging folks come together in a confrontation that resolves both a new and an old mystery. Strengthened by friendship and love of nature, they manage to save the fragrant heart of their community. 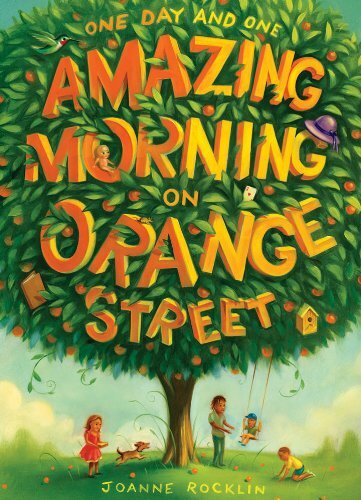 One Day and One Amazing Morning on Orange Street is a refreshing and soul-nourishing novel for ages 8 to 12. Try Molly Bang’s When Sophie Gets Angry, Really, Really Angry and James Howe’s Horace and Morris But Mostly Dolores. Previous Take Me Out to the Ballgame Next It’s Julia Donaldson. Why, didn’t you know? Janice, THANK YOU for your lovely, sensitive review. I and my characters feel so completely understood, and you have made my day. Great blog! Peace, Justice, Respect and Curiosity–I’m all for that! Thank you so much, Joanne. You’ve made my day, too! I hope many children — and adults — will discover and savor your lovely new novel. Bravo! Yes, Barbara, do! I hope you enjoy it as much as I did. Sounds wonderful – I might just have to read it – and I’m 62!